You do not get impatient. You do not bother why it works. It works. Once you get the algorithm and code it, it will be much simpler to visualize how it works. But, for 'why' -- you may need to research. One Aim: Approximately balanced tree creation. From root to leaf, no (simple) path is more than twice as long as any other. Color Constraint: Red nodes will have both of it's children black. Black nodes can have either. Number Constraint: For each node, simple path to all the leaves will have same numbers of black children. Wherever I refer Uncle, it means (same as in common life) -- "sibling of parent node", "the other child of node's parent's parent". We assume as NIL nodes of all the leaves are black. We always insert red node. So, We are not breaking #2: Number Constraint by adding a black node, but we are breaking constaint #1: Color Constraint. Keep the root node black. You will see, it makes life easier. It does not breaks any of the constraints. A Red uncle is a good uncle: If newly inserted node has red uncle, we can fix the situation just by fixing colors. Invert parent, grand parent, and uncle's colors. Now we need to check if grandparent is satisfying the Color Constraint. A black uncle on opposite side wants one rotation: If the uncle is black, we got to rotate. A slightly better case is when the newly inserted node is left child of its parent and uncle is right child of its parent or vice versa. In that case, you make a left-rotation or a right-rotation (rotations will be discussed later in this post). And then fix colors. 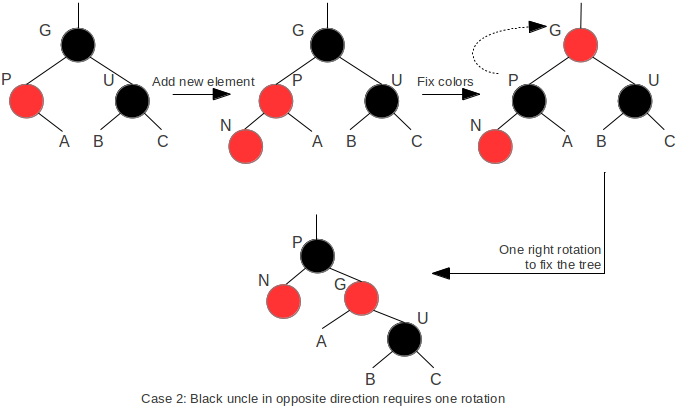 A black uncle on the same side is double as dangerous: A case when newly inserted node is right child and the black uncle is also right child or both are left children, you need to make a left-rotation if inserted node is right-child or right rotation if newly inserted node is left child. This will make it situation 2. The good thing about finding a black uncle is your quest ends there. No need to look further up the tree. Conceptually, you are done here. All left now is some slight minor details about plumbing rotation and a couple of fine prints in algorithm like some times rotation may cause root node reassignment, how we treat a NIL node a black node, etc. #Case 2, 3: Sirius Black. View a foundation video lecture. it worth watching. To get an albums photo. But I am unable to do this. and here I am using it to get photos. plz plz plz can you guide me to solve this problem.